Patchwork is a form of needlework that involves sewing together pieces of fabric into a larger design. In the past, it was a way to make use of leftover pieces of cloth to create clothing and quilts. Today, patchwork is a form of art, in which the designers use precious fabrics to create beautiful textiles. The use of uneven pieces of fabric in particular can result in real masterpieces and is therefore being practiced by a large number of textile artists. To create a beautiful quilt, however, requires effort and time, but the available patches just do not want to fit together. So choose your patches carefully and keep a healthy supply of buttons to not only finish your quilt, but to make it better and more beautiful than your opponent's. Combining things effectively can be tough. Like fitting several eccentric shapes in a small square. Or mixing several mechanics in gameplay for a rewarding yet brisk experience. Underneath Patchwork’s cozy, appealing presentation, there is a great multitude of gears whirring into motion with each turn. The game does an exceptional job satisfying both those who just want to sew cutesy patches onto a blanket as well as those who want to dig deep into the gears to find out what makes this complex mechanism tick. So what makes this small box a must-own for a gaming couple? You and your opponent (the game is strictly two-player) are competing at the high-stakes activity of quilting. Each of you starts with a blank 9×9 board that you need to fill, to the best of your ability, with patches, laid out in a circular pattern between players. The patches are reminiscent of Tetris pieces carrying the most tacky wallpaper patterns you can imagine. Each has two costs in time and buttons. (That is right, the game’ currency is buttons and saying “button income” for an unknown reason is utterly hilarious). The total time is limited for both players and is represented as slots on a track where both players’ pawns are marking their progress. Buy a patch, pay the price in buttons, and move your pawn up on the time track. Whoever is behind always gets to go (much like in Tokaido, another elegant design). Some patches grant you additional button income, granted at predefined points of the time track. The players take turn sewing on patches (or skipping their turn, effectively exchanging time for buttons) until they run out of time – at that time they are penalized for any empty spots on their quilt and whoever has the most buttons at the end is victorious. Patchwork is a part of Uwe Rosenberg’s small-box two-player game series (2p versions of Agricola and Le Havre being the others). It is a breeze to learn, set up and play, as the rules are highly intuitive and the presentation inviting and clear. The games fit comfortably into a tight 20-min slot and both players remain engaged and entertained throughout. The decisions you are presented with are bite-sized (you have at most four options you could potentially choose your turn) and that keeps analysis paralysis at bay. It never overstays its welcome; on the contrary, it lends itself very well to repeated plays due to the brief playing time. The pre-defined player count allows it to focus on a very specific kind of a gaming experience and deliver it with excellence; however, this does limit the cases in which you can get it to the table. It is easy to underestimate Patchwork for its simplicity. If you start thinking about it – there are several systems in play – you have a limited amount of time so you have to use it wisely. You have to know when to invest buttons and when to save up, including the timing of income points on the time track. You have to cover as much of your quilt in patches while making sure you are leaving yourself options for placing future ones. You can try to get the bonus points for completely covering a 7×7 square (giving you some leeway on your 9×9 board) or just focus on leaving as few blank spots as possible. Each decision that you make, while small, can potentially be weighed against three or four levels of consideration – do you go for an expensive small patch that will get you many buttons? Or a bigger weirdly-shaped piece that will cover a good area but will eat up a good chunk of your time? The absolute beauty of Patchwork is that you can think as hard (or not hard) about it as you want and still enjoy it. At no point do you feel overwhelmed, but if you do want to put in the extra effort – the game rewards you for it. The same is true for player interaction – quilters willing to put in the extra effort can study which patches would most benefit their opponent and work to block those. Or you can not worry about it and just hum to yourself while satisfying your obsessive need to have a neat and tidy quilt with no gaping holes. At no point does the game feel cutthroat, however and it is a very pleasant experience overall. There is no luck factor whatsoever so the game produces a calm and confident feeling of being fully in charge of your own creation. If you have a regular gaming partner (most applicable to significant others) – I would suggest you put Patchwork on your “must own” list. It does not make anyone feel bad and instead invites people to enjoy it at the level where they are comfortable. Somehow, perhaps due to the tranquil theme, the losses never result in bruised egos (although your mileage may vary depending on personalities). A good way to engage those newer to the hobby and a rock-solid option to have for some impromptu weeknight gaming. Highly recommended. If you enjoyed this review please visit Altema Games website for more neat board game materials. 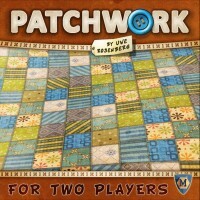 Much has been written about Patchwork (2014), and the game is enjoying rave reviews at online game sites and retailers. I had not played one of Uwe Rosenberg’s games prior to experiencing Patchwork, but I had been eyeing another of Rosenberg’s small box, two-player titles – Agricola: All Creatures Big and Small, for months. Looking at Patchwork’s box cover, with its muted earth tones depicting a quilted section of fabric, it would be easy to assume the game within would be as dry as dust. But that is not the case; Patchwork is an excellent two-player game. It has quality components in a compact box, and the instruction booklet is clear and detailed. Games take about 20 minutes, and Patchwork is easy to learn. I think gamers and non-gamers would enjoy Patchwork. Players work to fill their nine by nine boards with various shaped patterned pieces, and they must do so before the game ends. Setup is quick. Each player gets a square board and five buttons. Then they place the time track board in the middle of the table, and arrange the patch pieces so they encircle the time track. And lastly, they place the large pawn behind the specified starting patch. Players can purchase one of the three patches ahead of the pawn counting clockwise. When a player purchases a patch, the pawn is moved clockwise to the space vacated by the purchased patch. The timer is a shared two-sided board that has five single square patches along its path. The square patches are claimed when a player’s marker lands on or passes the space where a patch rests. Also along the timer path are printed images of blue buttons. When a player passes or lands on the button spaces, he gets “income” based on the number of buttons on his quilt. Buttons are the currency of Patchwork. Each of the quilt pieces has icons depicting their cost in buttons and in time. This is an ingenious concept, as it forces players to make impactful decisions on every turn. A player must decide which patch, if any, to purchase on his turn. If a player chooses not to purchase a patch, he can move his token along the time track until it is one space in front of his opponent’s token. Then the player gets one button for each space he moved. Some patches cost one or two buttons, but they have a higher time cost. Others may cost up to 10 buttons, yet have a time cost of just one or two. Paying a higher time cost moves a player’s marker further down the time track. And the game ends when each player reaches the end of the time track. This seemingly simple game can evoke a fair amount of analysis. Then there is the business of filling the nine by nine boards. The patch pieces come in a variety of shapes and sizes, and they must be placed immediately after being purchased. Sometimes irregular gaps may be harder to fill as the game progresses. A seven point bonus token is awarded to the first player to fill a seven by seven space on his board. Final scores are tabulated by subtracting two times the number of empty spaces on a player’s board from the total number of buttons the player has at the end of the game. Patchwork plays so quickly and is so enjoyable that I have yet to play just one game per sitting. It is light enough to play at a relaxed pace, yet is competitive enough to be exciting regardless of the game’s outcome. I could see this game eclipsing Jaipur or Targi as my favorite two-player only game. Patchwork is a true delight, and it is a bargain at around $25. Who could have guessed a quilting themed game would be so much fun? My girlfriend and I are always on the look out for good two player games. This is one of the best I’ve picked up in quite a while. It’s easy to learn, plays quickly, and is lots of fun. The basic idea is that you are making a patchwork quilt. It’s a strange theme for a game, I admit, but that adds to it’s quirky charm. The play is reminiscent of Tetris, in that you have oddly shaped pieces that you attempt to put together in the most efficient way. Each turn you will have the option of buying one of three available pieces. You can also forego buying a piece and grab a few buttons (the currency of the game). When you buy a piece you add it to your quilt, represented by a grid on your play board. Some of the pieces have buttons “sewn” onto them which score you more buttons at intervals throughout the game. Each button also has an associated time. The bigger tougher pieces take longer to add to you quilt. As you add a piece to your quilt, you move your piece along the time track which determines when the game ends. At the end of the game, players add up all their earned buttons, subtract some for any open spaces left on their grid and see who has the most buttons. You can also score a bonus for being the first player to fill a 7X7 grid without leaving any holes. That bonus has been the tipping point for victory in many of out games. It may not be the deepest or most innovative game I’ve played this year, but it is one of our favorites. Patchwork provides a simple, elegant experience for two players and has plenty to draw you back for many future games. Your goal is to make the biggest patchwork and earn the most buttons. The idea of the time line and the randomness and choice of the tetris-like pieces are well thought. Typical cardboard material, nothing special but all fits well in the theme. The rules are well explained and easy to learn. Great! This is a quick and elegant game, tactics and strategy are important, but I don’t think there is one winning strategy, so that’s a good thing. I’ve lost (suprisingly) many times focussing on the 7×7 bonus (yes, I know, it’s all about buttons and space). Can’t think of anything really annoying, but somehow the game doesn’t appeal to me that much, may be it’s the theme… Still happy to have this little masterpiece in my collection. Well-thought, little strategic game for 2 players. Elegant and original theme. Given the theme(making a patchwork quilt) I had not played this before and was therefore surprised by the playability of the game. I am however, a big fan of Uwe Rosenberg’s games and so I was talked into playing it. After playing the game will I buy it? No. I have a lot of games and I’m still not a jigsaw piece style game fan, however I don’t think I can get people to play it much. but would I play it again? Sure, and without desperately looking around for something else to play. If this seems like a contradiction in terms don’t misunderstand me, I enjoyed playing the game, but it is not one I want to own and bring to the table. That being said, feel free to judge for yourself. Each player has a blank board with an 11×11 grid on it. Pieces are laid out in a random order in a circle. A wooden marker is placed out as a starting point. There is a separate spiral path board that each player has a marker on at the starting point of the spiral. The players start with some button tokens and these are the currency of the game. The pieces have different shapes, sizes and 2 values. The first value is the cost of the piece in buttons and the second is the cost in time to attach the piece to your quilt. Going clockwise from the start position you can buy 1 of the next 3 pieces counting around the circle. Purchase a piece, add it to your quilt and move your token along the spiral a number of spaces equal to the time spiral. However, the location marker moves to that location and you now buy 1 of the 3 pieces available from that new location. Some pieces have 1 or more buttons on them. There are 2 important types of spaces on the spiral. 1 gives the 1st player to pass it a 1 square piece to fill in a gap in your quilt. The other earns buttons for you. Additionally, you can choose to move to the front of the group. This earns you buttons based on the # of spaces moved but burns time off. The 1st player to build a solid 9×9 grid gets a reward of 7 buttons. When you hit the end of the time spiral you are done. When all players are done you count the number of uncovered spaces (x) 2, (-) number of buttons and this is your final score. If you are already a fan of Uwe Rosenberg games, this is a must have for you collection. Like other Rosenberg games I have played there are a lot of detail on the components that draw you into the game. This is a great quick two player game that is easy to learn. As soon as you finish your first game you will want to play again so you can create a better quilt than before. There is a great struggle with trying to finish your own quilt while at the same time trying to force your appoint into using odd shaped pieces. Add a Review for "Patchwork"